I’m excusing a lot because I recognize the trauma and the loss you have suffered. But my patience isn’t limitless… unlike my authority. Something simple, with a twist. I will forever be intrigued and inspired by the Emperor’s Ordos, the holy Inquisition. This is, everything I do tends to get completely bonkers, and I want to challenge myself to do something nice and simple. 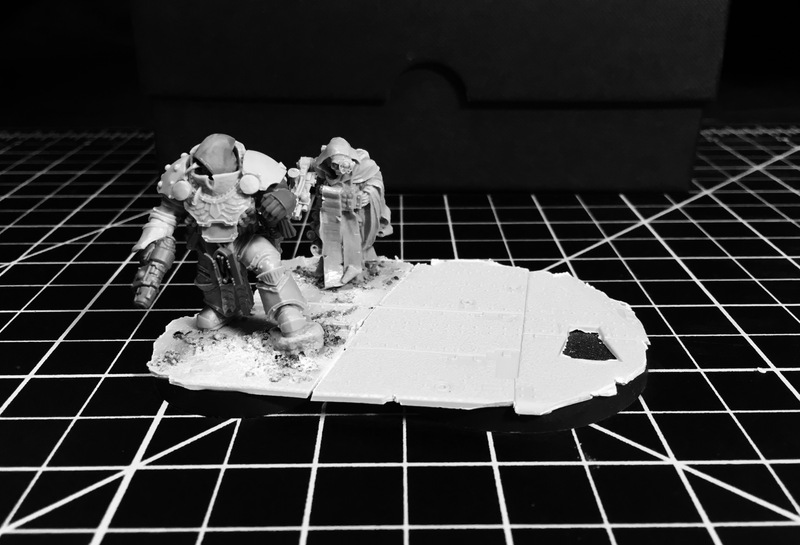 Inspired by the invitational, I decided to create a little mini project I will work on in between the Eldar and other craziness, of a different Inquisitorial archetype. I wanted the model to carry supreme authority. For anyone serving the Emperor can essentially consider an Inquisitor to be the Emperor. And everyone serving something else, can consider him death. Just a stance to say, I am authority. With small detail to make him unique. And then what would be the most blatantly sinister acolyte, or a pair? I thought some kind of an executioner to carry out the orders of extermination. One administering the punishment with neurotoxin, while penning the sins on a parchment for those who repent. The second will be a hulking beast dealing massive violence to those who don’t. Looks incredible. Can’t wait to see it painted. Love the use of the hood and facelessness of the inquisitor – leaves so many questions open. Who is he, what trail is he on, what secrets does he hide, whom does he really serve? Is he radical or orthodox, outcast or beloved? There are never enough creepy sidekicks! Some great fun can also be had playing with an airbrush to create subtle lighting on the ground.. It is hard to express how excited I am to see you working at Inq28 stuff again! I feel it is one of the places you excel most. And this character is no exception. With just a few subtle changes, you where able to really make this model not seem like a run-of-the-mill space marine. In particular, those Tartaros pattern shoulderpads work extremely well with that ornate power armor. I also like how the grav pistol actually looks to be a reasonable size next to his bulky armor. The hood, with the beak, is also very striking and evocative. The natural shadow that the hood creates, completely hiding his face, is key. GW has a tendency to completely show the faces behind such hoods, and I think it robs the mystery behind them, and leeches away most of their appeal. I am glad you did not suffer from this. Keep up the good work; I cannot wait to see more! It brings back exciting memories from the Invitational earlier this year! Thanks Eric. I honestly think we both just love this subject matter the most, rather than I particularly excel within it. I will certainly agree that we love the subject matter the most, but I think you sell yourself short. 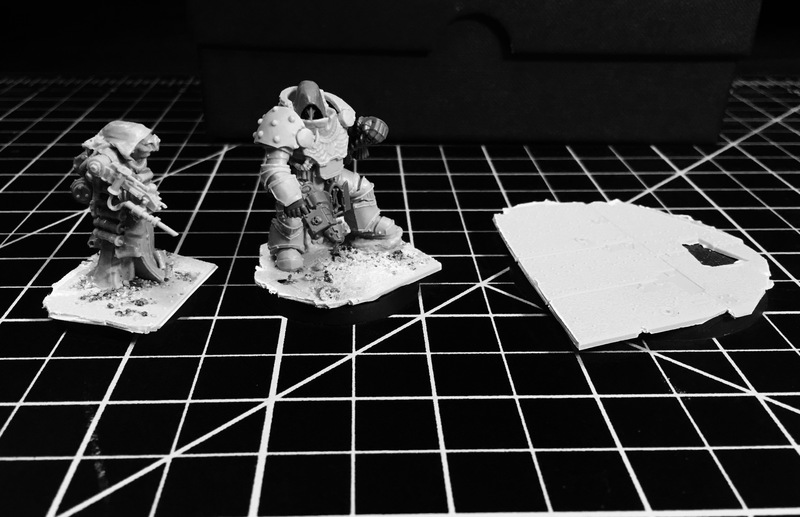 Your willingness to explore and craft your own subtle shade of what 40k is to you is something I love about all your models. And it particularly shows with your inq28 stuff. The inquisitor is grand! He is menacing yet regal and feral at the same time, so good. I can already hear the gloomy ambient. Convergent bases are brilliant.